An aerial view of the Poverty Point earthworks, built by the prehistoric Poverty Point culture, located in present-day Louisiana. Archeologists have identified more than 100 sites as belonging to this mound-builder culture, which also formed a large trading network throughout much of the eastern part of what is now the United States. Preceding the Poverty Point Culture is the Watson Brake site in present-day Ouachita Parish, Louisiana, where eleven earthwork mounds were built beginning about 3500 BC. Watson Brake is one of the earliest mound complexes in the Americas. Next oldest is the Poverty Point Culture, which thrived from 1730 - 1350 BC, during the late Archaic period in North America. Evidence of this mound builder culture has been found at more than 100 sites, including the Jaketown Site near Belzoni, Mississippi. The largest and best-known site is at Poverty Point, located on the Macon Ridge near present-day Epps, Louisiana. Poverty Point culture was followed by the Tchefuncte and Lake Cormorant cultures of the Tchula period, a local manifestation of the Early Woodland period. These descendant cultures differed from Poverty Point culture in trading over shorter distances, creating less massive public projects, completely adopting ceramics for storage and cooking, and lacking a lapidary (stone-carving) industry. Although the earthworks at Poverty Point are not the oldest in the United States  (the earthworks at Watson Brake were built about 1900 years earlier), they are notable as the oldest earthworks of this size in the Western Hemisphere. In the center of the site is a plaza, a constructed and leveled, flat, open area covering about 15 hectares or 37 acres (150,000 m2). Archeologists believe the plaza was the site of public ceremonies, rituals, dances, games and other major community activities. Archeological excavation has revealed a wealth of artifacts, including animal effigy figures; hand-molded, baked-clay cooking objects; simple thick-walled pottery; stone vessels, spear points, adzes, hoes, drills, edge-retouched flakes, and blades. Stone cooking balls were used to prepare meals. Scholars believe dozens of the cooking balls were heated in a bonfire and dropped in pits along with food. Different-shaped balls controlled cooking temperatures and cooking time. 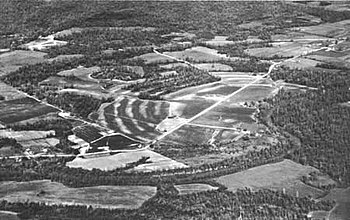 Wikimedia Commons has media related to Poverty Point. ^ "Poverty Point Culture: A Definition". Louisiana Division of Archaeology. Retrieved December 7, 2018. ^ Fagan, Brian M. (2005). Ancient North America : The Archaeology of a Continent (4 ed.). New York: Thames & Hudson Inc. p. 390. ^ Townsend, Richard F. (2004). Hero, Hawk and Open Hand : American Indian Art of the Ancient Midwest and South. London: Yale University Press. p. 17. ^ Berlo, Janet C.; Phillips, Ruth B. (1998). Native North American Art. Oxford University Press. pp. 75–76. ^ a b Fagan, Brian M. (2005). Ancient North America : The Archaeology of a Continent (4 ed.). New York: Thames & Hudson Inc. p. 418. ^ "Poverty Point". Archived from the original on October 26, 2009. Retrieved 2011-11-10. ^ "Poverty Point: The First Complex Delta Culture". Archived from the original on 2013-12-07. Retrieved 2011-11-10. ^ "Lapidary Beads". Lithiccasting Lab.